"RICOH THETA", the world’s first* spherical imaging device, can capture a fully spherical image encapsulating the photographer with one-shot. The device is a fusion of Ricoh’s original optical techniques and image processing technology. 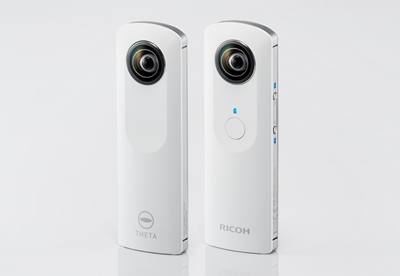 Ricoh developed the spherical imaging device "RICOH THETA" (Fig. 1), which can easily take a fully spherical image with a single shutter release, aiming to create a new image culture with spherical images, something which had never seen before. 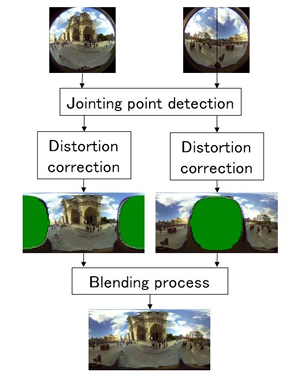 Until now, in order to photograph fully spherical images, many shots had to be captured with different angles of view for later synthesis by dedicated software, or a large camera equipped with many image sensors was required. This was not easy for general users. To simplify this kind of photography, Ricoh conceived, developed and designed a special device, focusing on portability and operability, and adhering to the concept "portable at any time," "ready to shoot every moment" and "leaving the scene." We then commercialized a thin, compact body imaging device that can photograph spherical images (Fig. 2) with one-shot, using various techniques cultivated by Ricoh. These include optical techniques, image processing technology, software skills and network infrastructure techniques. 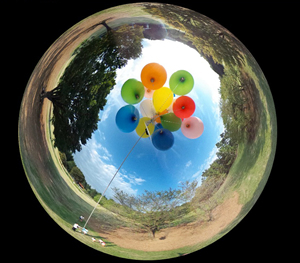 Spherical images are generated by shooting in four directions (left, right, up and down) at once centering on the device, with two super-wide-angle lenses (fish-eye lenses) positioned on both faces of the RICOH THETA main body. As Fig. 3 shows, the inflection optical systems are symmetrically-positioned, and in the respective inflection optical system, incident light from the super-wide-angle lens is reflected by a prism mirror, angled 90 degrees, and received by the image sensor (CMOS sensor). Two images obtained with two image sensors are thus synthesized to generate a complete spherical image. In RICOH THETA, we placed the prism inside the respective optical system; by bonding both prisms together, we substantially reduced the parallax influence between two points of observation (lens on both faces), which enabled the creation of a very compact device. 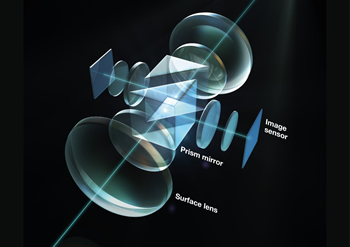 This is a uniquely developed micro twin-lens inflection optical system. Limb resolution of the lens also required attention. With the usual lens for digital cameras, central resolution is most important. However, with RICOH THETA, because a spherical image is generated by jointing two images, there is no distinction between center or limb on the image a user ultimately sees. The same resolution is called for both limb and center. Ricoh achieved an optical system that shows no image deterioration over the entire image by changing magnification of the image limb. Ricoh's optical techniques made possible an ultra-wide-angle lens of more than 180 degrees with equivalent resolution over the entire image, further making the fixing of these two ultra-wide-angle lenses possible without position displacement. Beyond that, the lenses are processed so as to minimize the risk of lens cracking or staining. 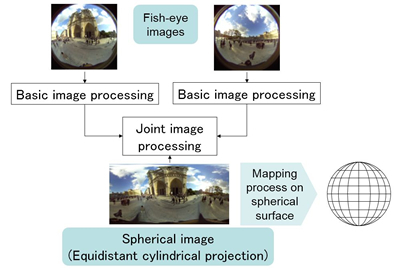 The image processing flow in the spherical imaging device is as shown in the Fig. 4. First, basic image processing is executed using image data obtained from two image sensors. Here, processing is executed so as to obtain images mostly equal in brightness and shade from the two image sensors, in addition to the image processing basically done with usual digital cameras. Specifically, the individual image sensor's difference in sensitivity is adjusted, and exposure is controlled for each of two image sensors, by comprehensively judging the brightness detected from two image data. The joint image processing of the two images is then executed. First, in each of the two images, the amount of displacement is calculated between the standard image and the reference image by pattern matching processing for respective areas, so as to detect jointing points, as shown in Fig. 5. The two images are then converted into spherical-image format, respectively, taking account the detected jointing points and the lens properties of the respective optical system. Finally, the two images in the spherical-image format are blended to generate one spherical image. Thus, detecting the jointing points by pattern matching processing and reflecting them to image conversion parameters of the spherical image format make it possible to joint two images in real time. Spherical images use equidistant cylindrical projections, and the position of respective pixels correspond to the spherical superficial coordinates. Taking the earth as an example, the earth's surface is imaged two-dimensionally, setting the latitude and longitude as the two axes. The user can browse the spherical image with a dedicated application while varying observing points by moving the image vertically and horizontally or enlarging/shrinking the image, with the finger. In the processing of the application, mapping of the spherical image as a texture on the surface of a spherical object is performed, and by specifying the direction and the angle of view, a view (Fig. 2) as if a spherical image were pasted on the spherical surface is displayed. Bring innovation to the imaging experience! Images are being produced using RICOH THETA that were heretofore unseen in the world. These images are transmitted from the user and shared around the world through the Web and SNS. Thus begins a new image culture. 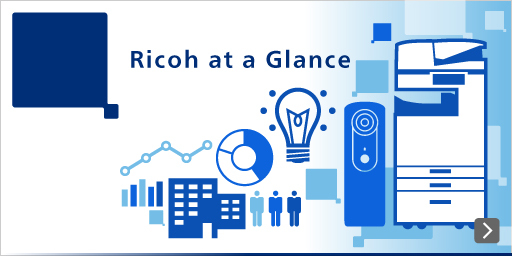 Ricoh will continue to create and provide our customers with products that impart innovation to the imaging experience, making full use of techniques cultivated by Ricoh. Sorted by : field "Devices" | product type "Visual Communication"
"Value Creation to Defy Common Wisdom Spawned through Belief, Tenacity, and then 'Heated Arguments with Colleagues'"
（Mar.31,2016）RICOH Announces "RICOH THETA × IoT Developers Contest"
（Dec.22,2015）【Ricoh/Ricoh Imaging】Notification of Release of "THETA+ Video" Dedicated App that Allows Video Editing"
（Sept.3,2015）Ricoh Unveils New Fully Spherical Portable Camera: RICOH THETA S"
（Aug.20,2015）Ricoh Selects the Winning Works of the RICOH THETA Developers Contest"
（Jul.7,2015）【Ricoh/Ricoh Imaging】Release of the newly developed image editing app "THETA+"